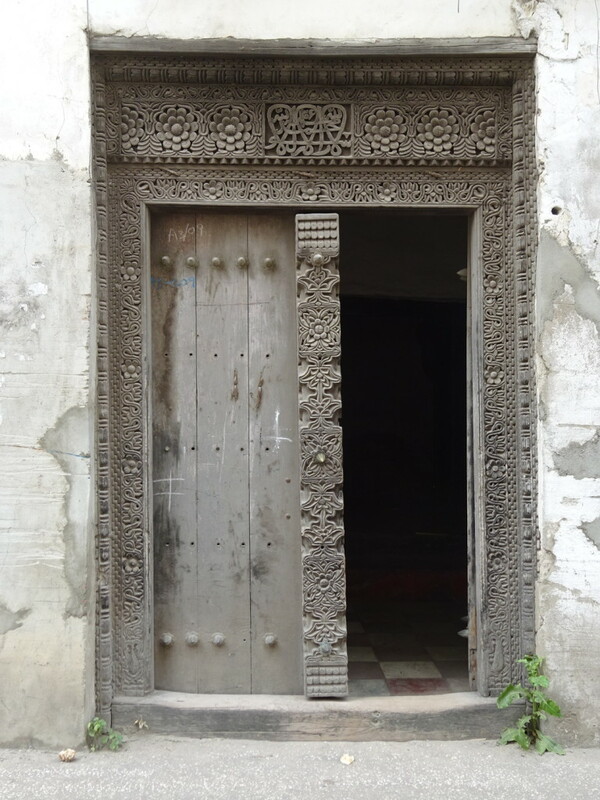 Posted on June 25, 2015 by No Map Required Posted in Places, Tanzania	. 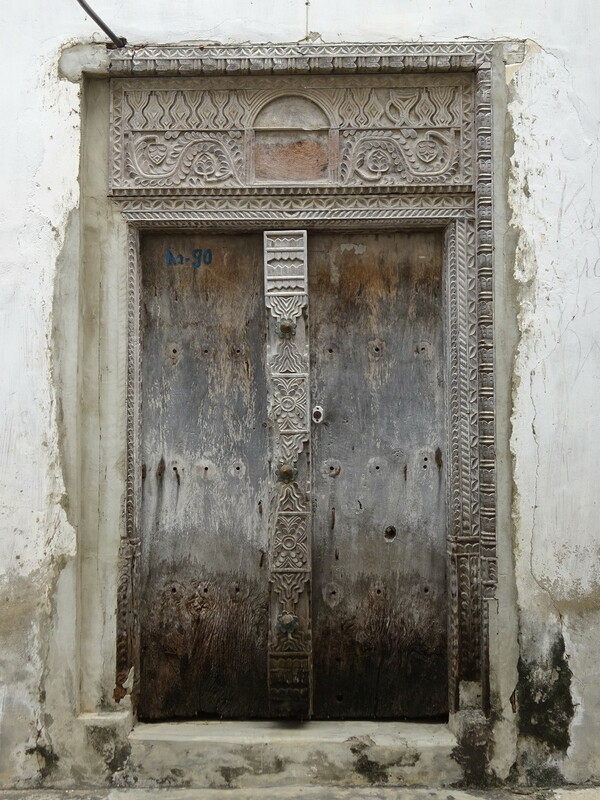 In the city of Stone Town on the island of Zanzibar off the coast of Tanzania, one thing you’ll find most everywhere is amazing doors! Some of them are from back in the 1800’s, though most are a bit more modern – regardless, the carving on them is spectacular! I really, really, really recommend clicking on the photos to see the carvings bigger as the detail is mighty impressive! Check out the detail work! All carved by hand. 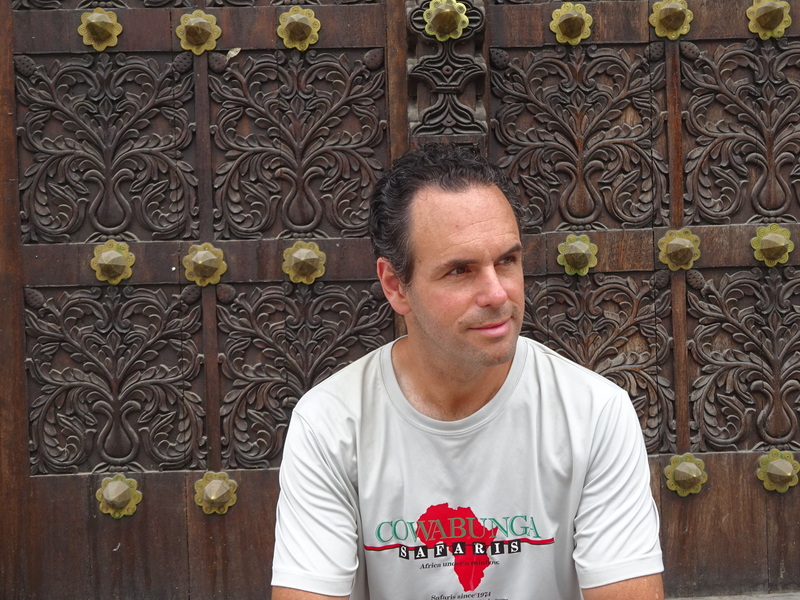 Zanzibar is an amazing mix of cultures. It’s known as an area where Arabs, Indians, colonial Europeans and Africans mixed as a central point for the African slave trade; a tragic history that is evident absolutely everywhere you go on the island. Even many of the doors hold this history with carvings of chain-links which meant that the one-time occupants possessed and traded slaves. 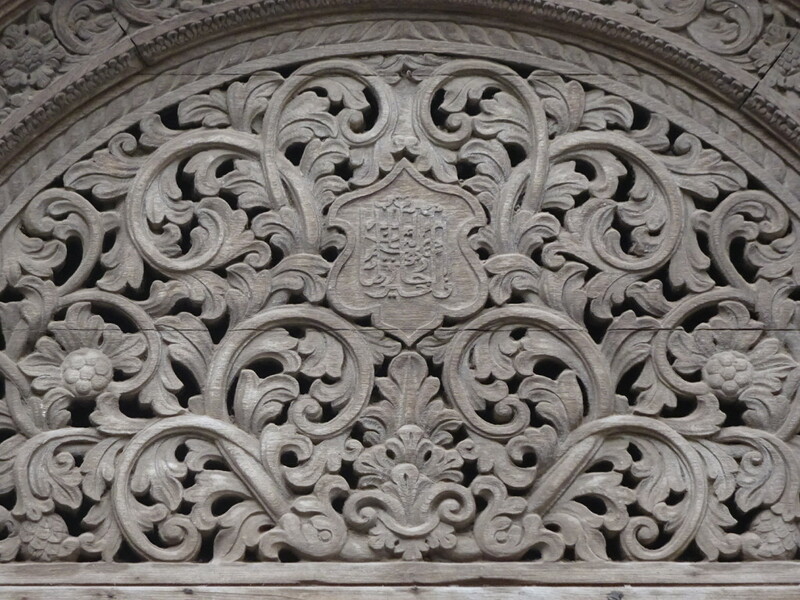 The carvings in general told about the families and their vocations. 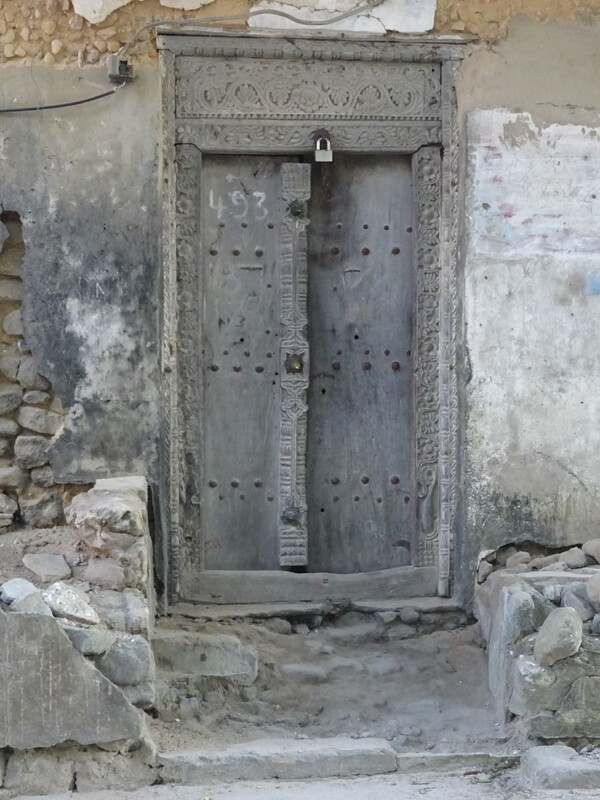 A flower carved on a door indicated a distinct family unit lived there – many flowers meant many families lived in the same space. Rope carving (like rope on a fishing net) = fisherman; Vines = spice traders; Squares = someone who liked math or an accountant; and Beads = jeweler. I guess if we had a door it would have beads, squares (for a love of engineering) and cookies carved into it (cookies for obvious reasons!). 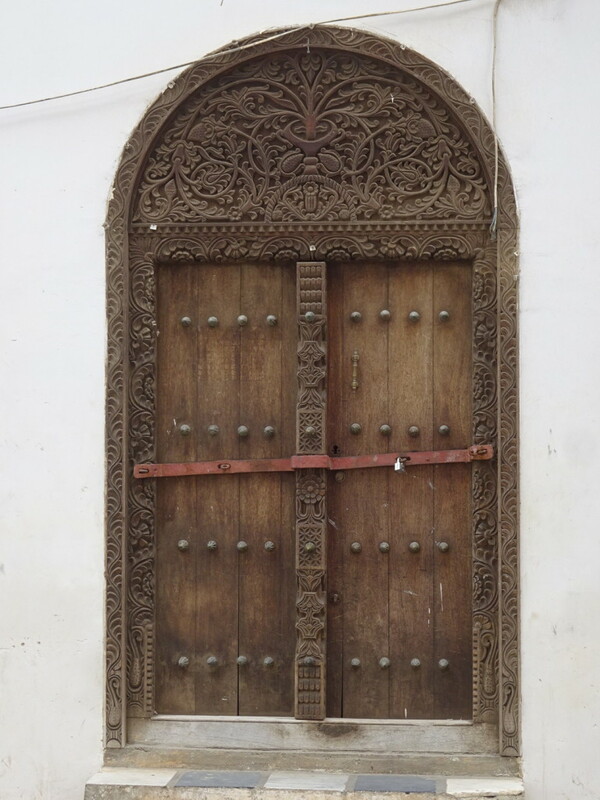 Arabian doors were originally flat on top, while later ones often have a classic arching top design with a quotation from the Quran carved in. Amazing upper carving!!! 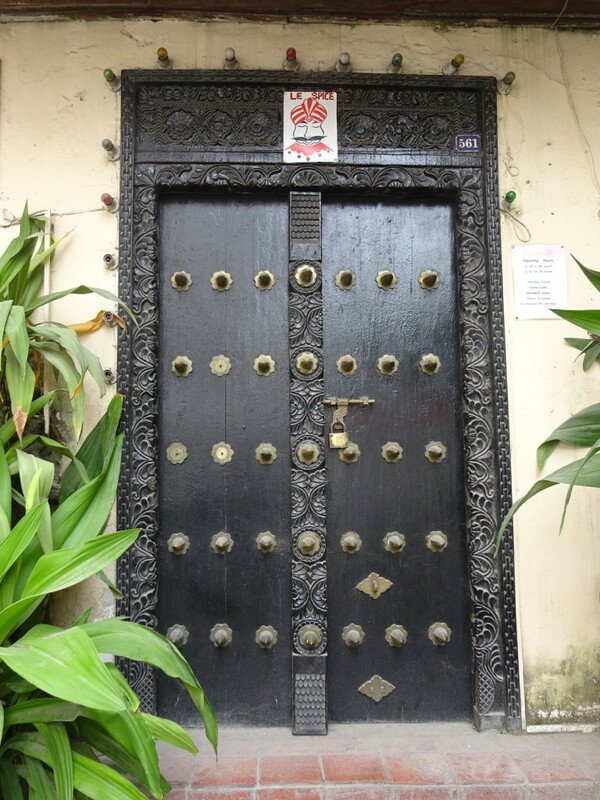 You can see the flowers along the top and chains along the sides. 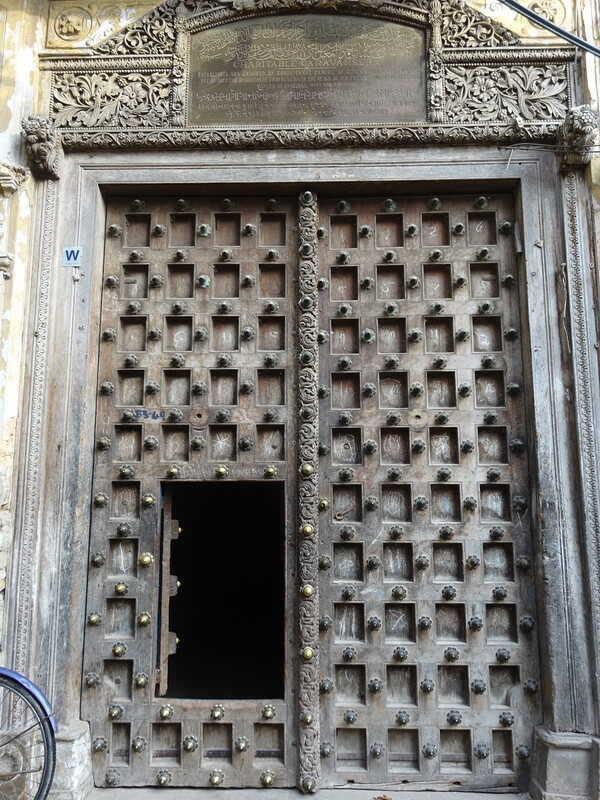 A later Arabian door – note the Arabic carving in the top! 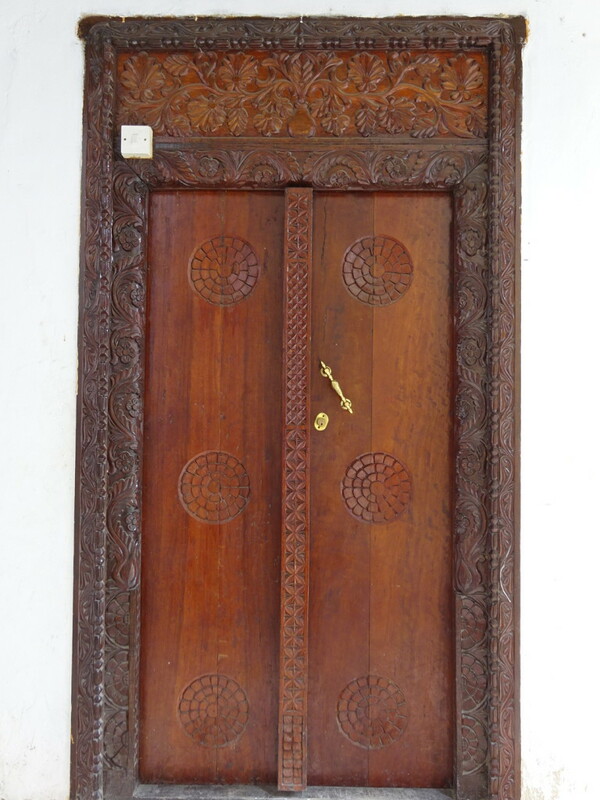 Indian doors are particularly known for the spikes coming out of the doors themselves. The story goes that Indians used to use elephants for travelling around (and war!) and occasionally the elephants liked to rub against the doors (on safari we saw the destructive effect where they had rubbed against trees!). To deter them, the Indians added the spikes which, unsurprisingly, the elephants didn’t like to rub their heads against! There never were elephants on Zanzibar, though, so this must have just been brought over as a decorative idea! Quite a fancy one – not all are nearly this upkept! Spikes galore! Plus some vines and chains. Many of the doors have these huge chains dangling off that can be hooked to a ring on the ground to lock the door closed. 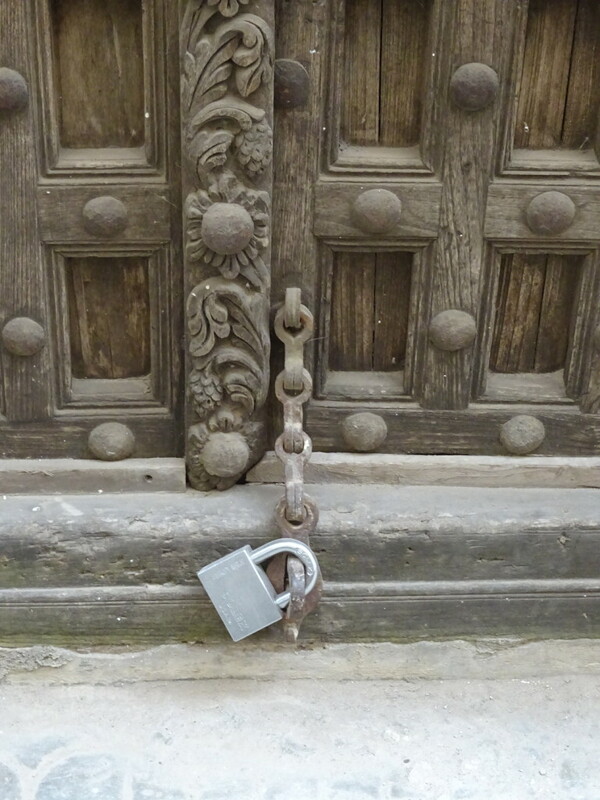 When not locked to the ground, the chains are hooked on the door itself. Often just on a nail, not so fancy as this one. 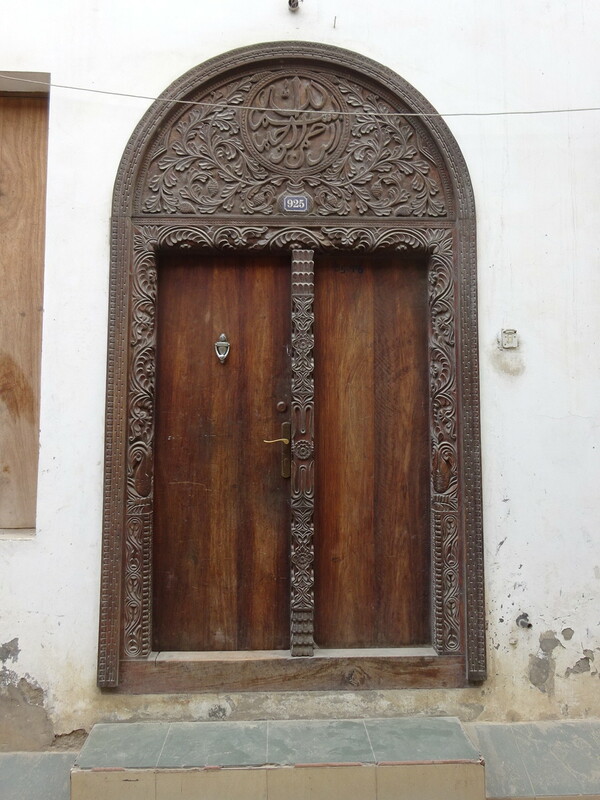 I have to say, they sure knew how to do some amazing carving there on Zanzibar! Not common anymore, the inset doors allowed folks to go through without opening the whole door. We saw about 10 folks exit this door…makes you really curious how big the house is behind it! 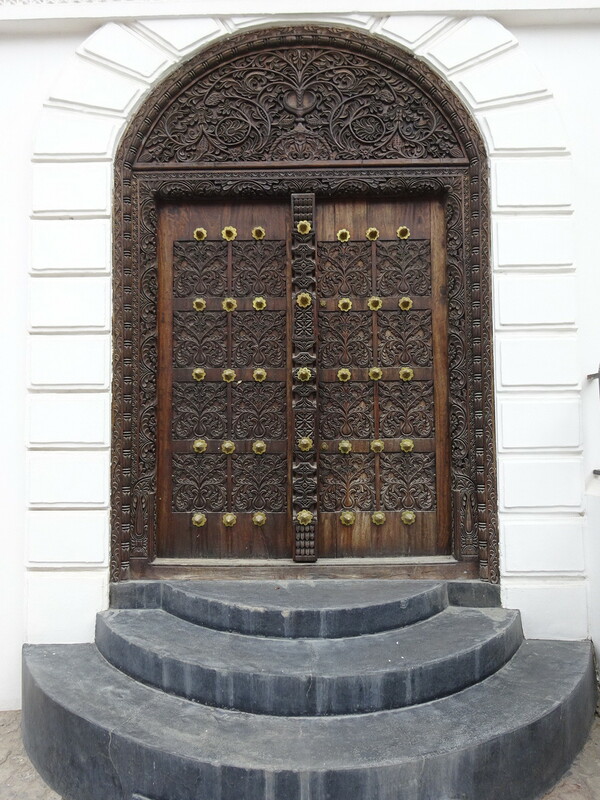 This was the entrance door to a museum, if I remember right. Much more weathered, but still beautiful! 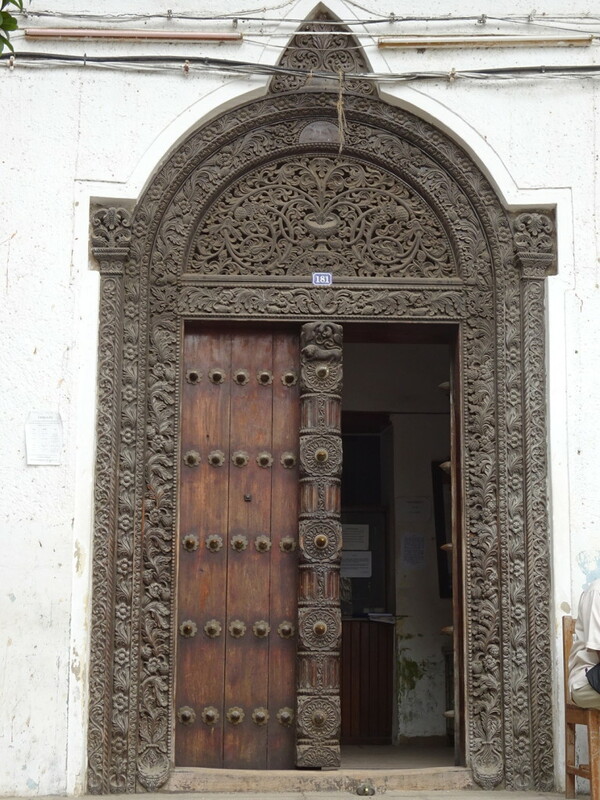 Some doors had the door itself and handle modernized, but kept the original carved frames. You can definitely tell which side folks have walked in on for the last couple hundred years! And look at all those squares — Accountants lived here!! …and NOT the ones painted on the walls of the new Hyatt hotel. Ugh! 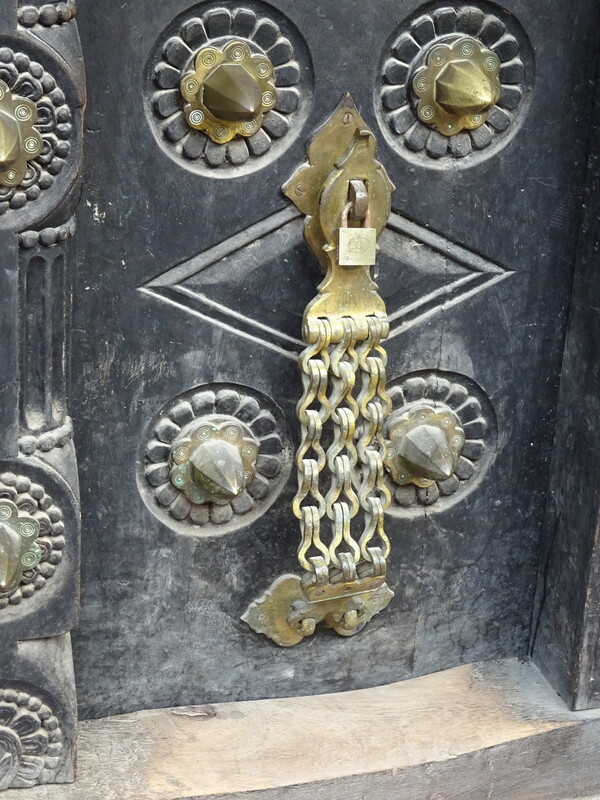 I’ll stick with imagining the world behind these magical doors instead! 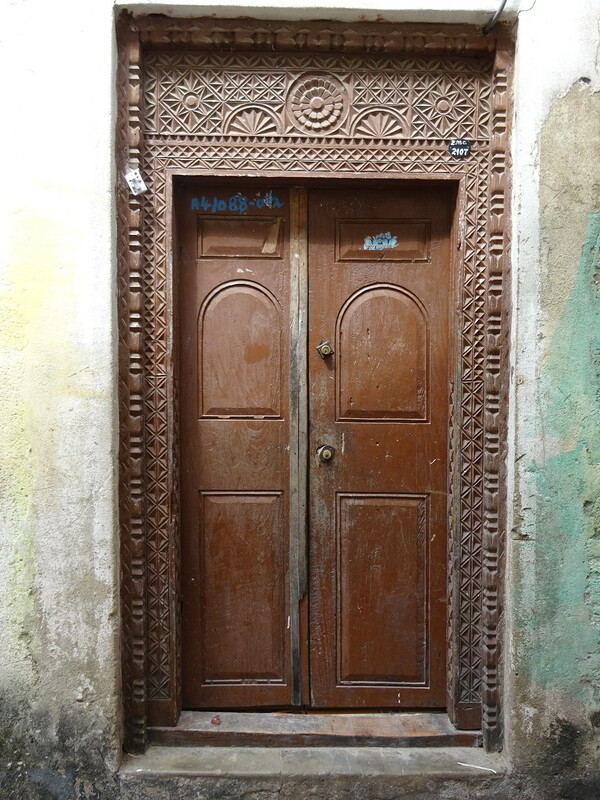 Such stories these doors could tell! What a neat collection of pictures! I love the idea of a door telling a little bit about what happens/who lives inside. Very cool. It was fascinating to see who might pop out when we happened to see one open! Behind every door, a million stories. I love these doors! Bring me back a couple, will you? Love the tee shirt Aaron. If only they could have fit in our packs! Beautiful! I love all your art photos! I even like the painting. 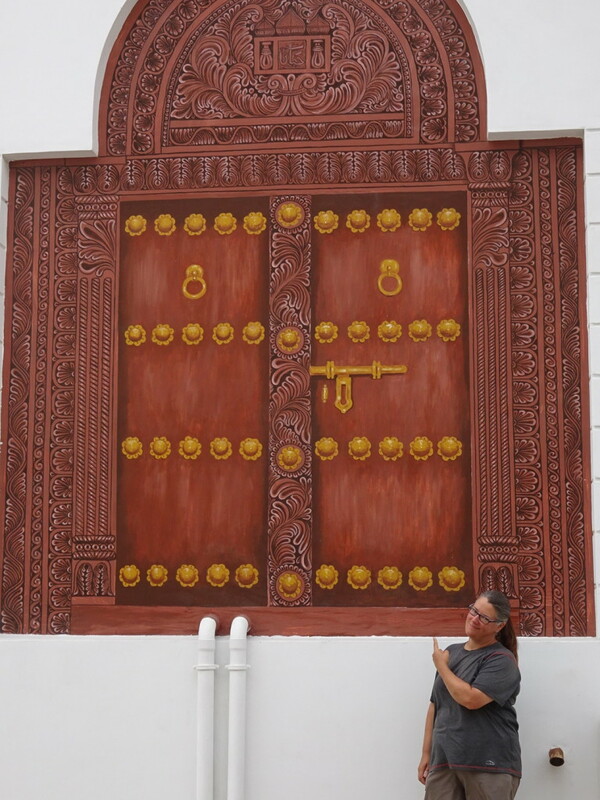 The painting was actually pretty well done, but it just paled compared to the actual doors!